Community Youth Advance – Harnessing the power of community to help our youth thrive. Community Youth Advance is dedicated to advancing the academic, social and career opportunities of boys and girls by providing them, and their families, academic enrichment, mentorship, college prep assistance and access to career training. Community Youth Advance provides comprehensive educational and character-based programming for students in grades K-12. Our academic programs include extended-day, Saturday, and summer learning opportunities. Our programs are staffed by certified educators. Science, technology, engineering, art, and math are integral to our curriculum. Pathways introduce students and mentees to college and career options and are integrated into our academic and mentorship programs. Experiences include college tours, test prep, and mock interviews. Our flagship mentoring program utilizing a matching system to ensure maximum compatibility for optimal relationship building. Our ability to affect the lives of young people rely on the mutual trust between mentor and mentee. The work of Mentoring to Manhood is both important and critical to our community. The key elements of the program focuses on insuring that the young male participants have access to attainable educational goals, understand and embrace self-confidence and awareness, and engage in service to Prince George’s County and the region. Supporting this program was an easy commitment for me to make because I understand the future, and these young men are our future. We simply can’t underestimate the value of investing in our young people. Mentoring to Manhood is a great example of a proactive and worthwhile investment that provides an opportunity for boys to grow and thrive rather than to fall down a negative path that’s significantly more costly long term for them, for our communities and for our state. The mentors go above and beyond with their time and energy to give the mentees the resources needed to be successful in life. Most importantly, Anthony now has another support system that is partnering with us as parents to reinforce the values that we have instilled in him. We absolutely love the program and we love the changes in our son as a result of the program. When I joined the tutoring program, I had a 2.75 GPA. The tutoring I received boosted my 2nd quarter report card grades to a 3.67 GPA. We’ve all heard the African proverb ‘It takes a village to raise a child.’ Effective mentoring can only be achieved with community involvement. 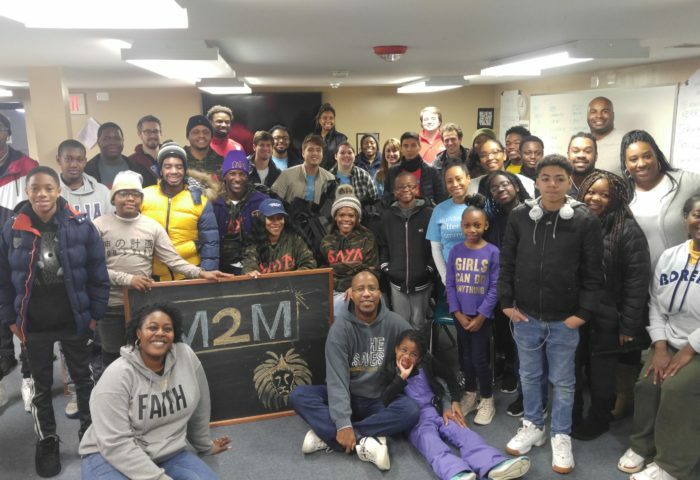 Successful nonprofits like Mentoring to Manhood offer many ways to become involved and tangible ways to contribute that make a marked difference in the lives of teen boys, their families, and communities. I couldn’t get my grades above a C in my main classes. Thanks to M2M, I improved my grades to finally making honor roll for both the 3rd and 4th quarters. After attending this year’s college fair, I realized the importance of going to college and decided that’s where I want to be. Talking with my mentor helped me identify purpose in my own life, and that college could facilitate my new ambitions. My mentors helped me not only overcome my academic challenges, but a few behavioral challenges as well. Each mentor held me accountable. By the end of the 3rd Quarter, I had more B’s than ever before and managed to stay out of the Principal’s office the entire year.